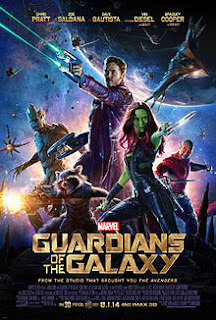 “Guardians of the Galaxy” is the rare type of summer movie that makes you smile from ear to ear throughout and walk away feeling like whatever troubles you've been having in the world just managed to disappear for a couple of hours. I can confidently say this since the last couple weeks of my life haven't exactly been what I would consider “fun” by any stretch of the imagination, and worries of financial security and future comfort have dogged me constantly (as I'm sure they have for many of you out there as well). During these time periods my job can be its own worst enemy because sometimes it feels that there aren't that many surprises out there anymore. Marvel movies have certainly not been as much fun as they've used to be, as every film brings a certain degree of “been there, done that.” And when you're job is to review the escapism that other people use to escape their problems, then where does the critic turn? Never mind. With “Guardians of the Galaxy” we find the usually bankable studio taking a chance on a concept that isn't much of a safe bet these days. There are no familiar superheroes, the comic this is based on is fairly unknown to most people, and the villain is so obscure that when he cameoed at the end of “Thor: The Dark World” I doubt anyone really made the connection of who he was. Most Marvel movies have one central character with normally a couple of supporting characters at his side (sorry girls, I haven't seen Marvel make a movie with a female superhero lead yet) to fight a villain. In “Guardians of the Galaxy” we are introduced to a group of characters of various different kinds. Although we've been told that making a good superhero team up is not possible without first having developed said characters in previous films, “Guardians of the Galaxy” throws that whole concept out the window. 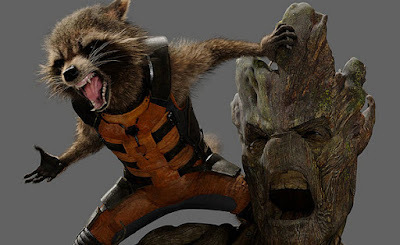 My personal favorite team member is a raccoon named Rocket (Bradley Cooper), who used to be a human but now is a smart-alecky fur ball who comes in handy with a machine gun. He has a traveling companion named Groot (Vin Diesel), a giant tree creature whose vocabulary is rather limited (he's limited to the words I, am, and Groot…in that exact order). The only member who doesn't appear interested in the orb is a man named Drax the Destroyer (Dave Bautista), but he is interested in the kind of people the orb can attract. There is a villain who wants the orb for the power unknown to us; however he takes a backseat to the superheroes themselves. Like the orb he exists largely to give our characters something to do and someplace to go. Most movies from this genre have gotten so by-the-numbers that by this point though I think I've long since stopped caring about why superheroes do the things they do. Once in a while I'll get an “X-Men: Days of Futures Past” and “The Dark Knight,” but I find most superhero films are best when they are mostly fun with just enough heart to make it all worthwhile. 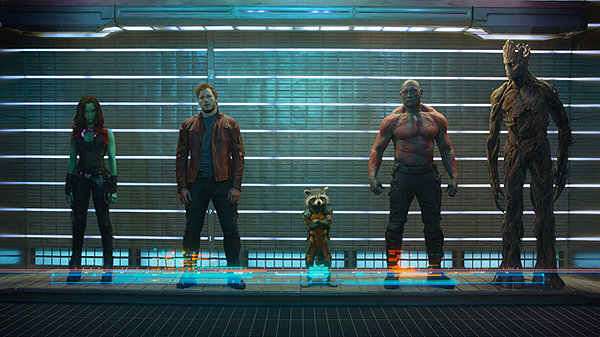 “Guardians of the Galaxy” is far and above the most fun I've had at a superhero movie in over a year at this point. 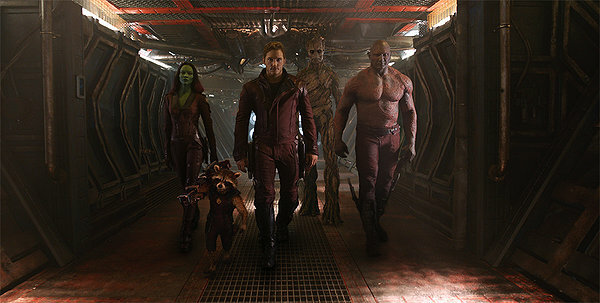 This is the kind of superhero movie you take your parents to as well as your friends. It struts around like a science fiction comedy rather than a comic book adaptation. It's got this personality that is infectious and booming. In other words, movies like these are the reason God gave up popcorn. Watching this film I got the sense that this is what “Star Trek” must have felt like when people first discovered that series. The worlds are so unique and so fun it's a joy to see where everyone goes. The cast is diverse and the different aliens look jarring on the surface yet somehow fit the same universe perfectly. Why, most of them even look like real beings as opposed to computer graphics! It feels strange to be saying this, but this is the first Marvel movie since “Iron Man” where the discovery of the world itself was just as much fun as the characters. 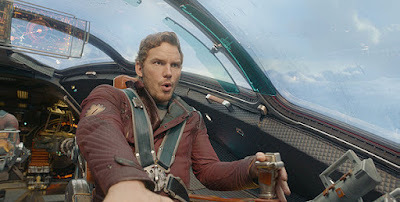 I do feel that Marvel abuses their catalog and is largely a sequel churning franchise machine, but “Guardians of the Galaxy” is reassuring because it shows the company is still willing to take a risk once in a while and take a risk in a big way. 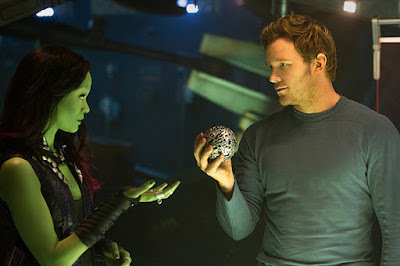 I think this risk is going to pay off tenfold and I suspect we'll be seeing more of Rocket and Star-Lord in the future. Parents, the violence is mostly cartoonish. There is a fair amount of bad language though. Recommended for ages 13 and up.